Forts and Tigers and Sharks, Oh My! Point Defiance Park is only about a forty minute drive from the Seattle Southside Visitor Center in SeaTac, so we were able to get there in no time (but you’ve got to go early!). We drove by magnificent rose gardens and the Point Defiance Pagoda that my dad helped restore a few years earlier. But that’s a story for a different time. 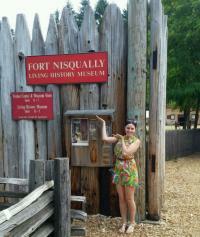 The first stop on our journey was the Fort Nisqually Living History Museum. The 1850s fort has been restored and relocated to its current location in Point Defiance Park, but it was originally the Hudson’s Bay Trading Company trading post, the first European settlement on the Puget Sound. For anyone interested in Pacific Northwest History, this site is a must see and it features a National Historic Landmark, in the original Fort Nisqually Granary. We had a blast trying on historical clothing, playing traditional games and learning about the history of the site from volunteers and staff members in costume. The first man that we met in the town store asked if we had come to the fort on-foot after a few days travel. My quick-witted response was initially “Haha, no!” But once I was reminded by my trusty girlfriend that we had traveled back in time to the mid-nineteenth century, I was able to have an entertaining and educational conversation with the man about beaver pelts. The Fort Nisqually Living History Museum comes highly recommended from this blogger, and with all the games and crafts, it’s also perfect for kids. The next stop on our journey was the Point Defiance Zoo & Aquarium. This unique place has the best of both worlds when it comes to zoos and aquariums. Asian elephants and Pacific walruses, lemon sharks and Sumatran tigers; Point Defiance Zoo has majestic creatures from all around the world. We started off at the South Pacific Aquarium, where we had a couple close encounters of the shark kind. The massive tank had plenty of viewing space to see the Lemon Sharks up close and it was also an opportunity to get out of the Seattle sun for a bit. From there, we moved on to the Asian Forest Sanctuary, where we came face to face (behind protective glass) with a Sumatran Tiger! The experience of seeing this big, curious cat so close was very exciting. The crowd would “ooh” and “aah” every time the big boy would stand on his hind legs and scratch the wooden pillar in his habitat. He even pushed his face against the glass toward my girlfriend for a few moments, which startled her and resulted in her falling on her posterior. By this point, I was very impressed with the zoo. It was grrrrrreat! We continued our journey through the zoo & aquarium and had great views of many different kinds of land and aquatic animals. Oftentimes with zoos, one can be disappointed by sleeping animals or cage cleanings on the day of visit, but we had none of these problems. It may have just been luck, but I attribute it to the strategic layout of the exhibits, and the mid-day feedings. So, a tip of my hat goes out to you, Point Defiance Zoo & Aquarium for creating the best zoo experience possible. I also appreciate the fact that you kept the red wolf from complete extinction (yes, you can see the red wolves there as well). We had a great day at Point Defiance Park and we didn’t even experience half of what the 702-acre park has to offer. I highly recommend Point Defiance Zoo & Aquarium as well as Fort Nisqually, for a fun-filled day. Bring the whole family and rest assured that the kids will sleep great that night. Fort Nisqually Notes: Price: $4.00-$7.00 (kids under 4 get in free). Memorial Day - Labor Day the Fort is open daily. The rest of the year it is open Wednesday - Sunday. Check the website for hours. Point Defiance Zoo & Aquarium Notes: Price: $8.75-$17.00 (kids under 2 get in free). March 1 - October 1 the Zoo & Aquarium are open daily. In the winter it is open Thursday - Monday with the exception of Zoolights. Check the website for hours.